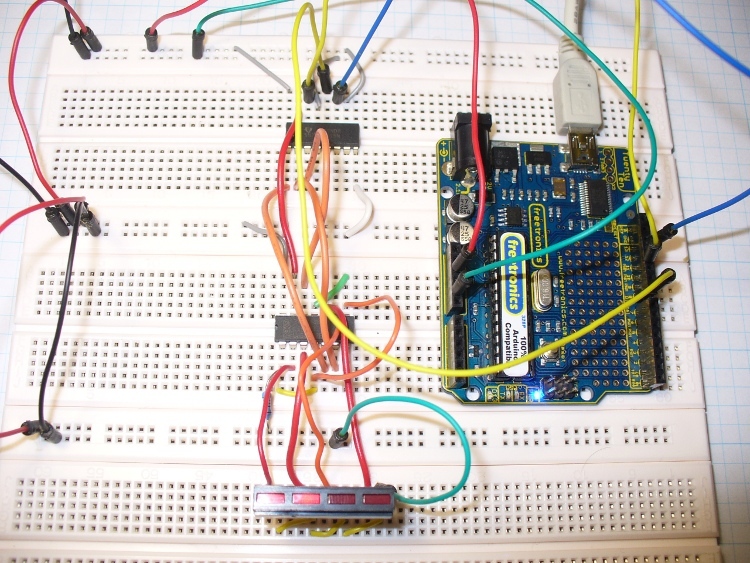 Use the NXP PCF8563 real-time clock IC with Arduino in chapter fifty-four of our Arduino Tutorials. The first chapter is here, the complete series is detailed here. Recently a few people have been asking about the PCF8563 real-time clock IC from NXP – so this is a tutorial on how to use it for time, date, alarm clock and square-wave generation purposes. The PCF8563 is another inexpensive RTC that can be used with an Arduino or other platforms due to the wide operating voltage (1 to 5.5V DC), I2C interface, and very low power consumption (when powered by a backup battery it only draws 0.25 μA). If you aren’t up to speed on the I2C interface, please review the I2C tutorials before moving forward. And please download the data sheet (.pdf). Don’t panic – you can also get it in a breadboard-friendly DIP (through-hole) package as well, and also on a pre-built module from the usual suspects. * You can skip the diodes and battery if you don’t want a backup power supply when the main power is turned off or removed. 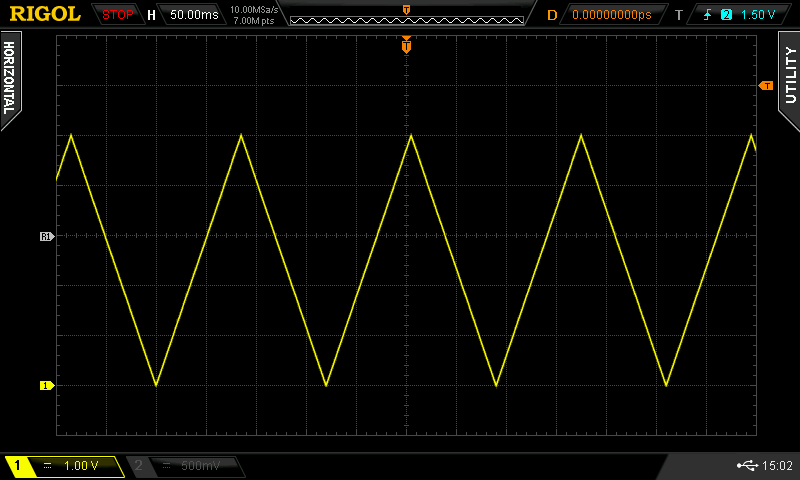 Pin 3 is for the interrupt output (we’ll consider that later) and pin 7 is for the square-wave oscillator output. Now to get down into the land of I2C once more. 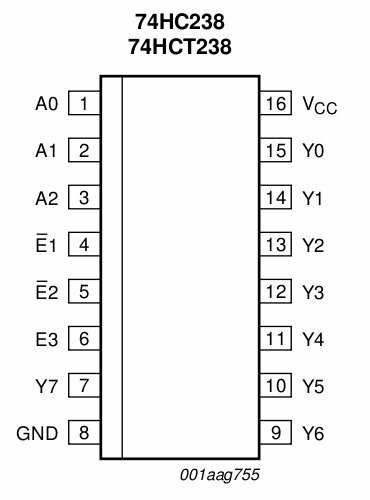 When looking through the data sheet NXP mentions two bus addresses, which have the same 7-bits finished with either a 1 for read or 0 for write. However you can just bitshift it over one bit as we don’t need the R/W bit – which gives you a bus address of 0×51. There will be a few other registers of interest, but we’ll return to those later. For now, note that the time and date start from 0×02. And one more thing – data is stored in the BCD (binary-coded- decimal) format. But don’t panic, we have a couple of functions to convert numbers between BCD and decimal. Writing the time and date is a simple matter of collating the seconds, minutes, hours, day of week, day of month, month and year into bytes, converting to BCD then sending them to the PCF8563 with seven Wire.write() functions. Reading the data is also easy, just set the pointer to 0×02 and request seven bytes of data – then run them through a BCD to decimal conversion. With a catch. And that catch is the need to sort out unwanted bits. Revisit table 4 in the data sheet – if you see an x that’s an unused bit. If any of them are a 1 they will mess up the BCD-decimal conversion when reading the register, so they need to be eliminated just like a whack-a-mole. To do this, we perform an & (bitwise AND) operation on the returned byte and mask out the unwanted bits with a zero. How does that work? Example – the byte for dayOfMonth is returned – we only need bits 5 to 0. So 6 and 7 are superfluous. If you use (dayOfMonth & B00111111) the & function will set bits 6 and 7 to zero, and leave the other bits as they were. As with any clock or RTC IC, an oscillator is involved, and as mentioned earlier you can take this from pin 7 of the PCF8563. However – it’s an open-drain output – which means current flows from the supply voltage into pin 7. For example if you want to blink an LED, connect a 560Ω resistor between 5V and the anode of the LED, then connect the cathode to pin 7 of the PCF8563. 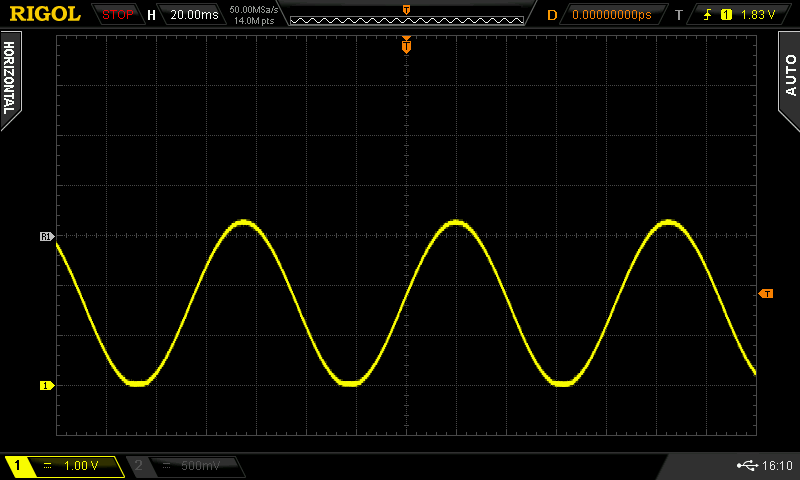 0 turns the output off and sets it to high impedance. 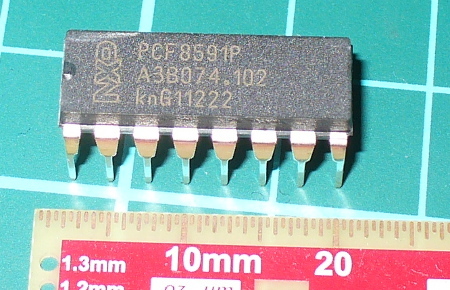 The PCF8563 monitors the oscillator and supply voltage, and if the oscillator stops or the voltage drops below a certain point – the first bit of the seconds register (called the VL bit) is set to 1. Thus your sketch can tell you if there’s a chance of the time not being accurate by reading this bit. The default value is 1 on power-up, so you need to set it back to zero after setting the time in your sketch – which is done when you write seconds using the code in our example sketches. Then from that point it can be monitored by reading the seconds register, isolating the bit and returning the value. This function may sound frivolous, however if you’re building a real product or serious project using the PCF8563, you can use this feature to add a level of professionalism and instil confidence in the end user. However there is a catch – the MSB (most significant bit, 7) in the registers above is used to determine whether that particular register plays a part in the alarm. For example, if you want your alarm to include hours and minutes, bit 7 needs to be set to 1 for the hour and minute alarm register. Don’t panic – you can easily set that bit by using a bitwise OR (“|”) and B10000000 to set the bit on with the matching data before writing it to the register. Checking if the alarm has occurred can be done with two methods – software and hardware. Using software you check bit 3 of the register at 0×01 (the “AF” alarm flag bit). If it’s 1 – it’s alarm time! Then you can turn the alarm off by setting that bit to zero. Using hardware, first set bit 1 of register 0×01 to 1 – then whenever an alarm occurs, current can flow into pin 3 of the PCF8563. Yes - it’s an open-drain output – which means current flows from the supply voltage into pin 3. For example if you want to turn on an LED, connect a 560Ω resistor between 5V and the anode of the LED, then connect the cathode to pin 3 of the PCF8563. To turn off this current, you need to turn off the alarm flag bit as mentioned earlier. // turns off alarm enable bits and wipes alarm registers. if (test == B00001000) // alarm on? Hopefully you found this tutorial useful and now have the confidence to use the PCF8563 in your own projects. Furthermore I hope you learned something about the I2C bus and can have satisfaction in that you didn’t take the lazy option of using the library. People often say to me “Oh, there’s a library for that”, however if you used every library – you’d never learn how to interface things for yourself. One day there might not be a library! And then where would you be? So learning the hard way is better for you in the long run. If you have any questions leave a comment below, or ask privately via the contact page. And if you enjoy my tutorials, or want to introduce someone else to the interesting world of Arduino – check out my book (now in a second printing) “Arduino Workshop” from No Starch Press. 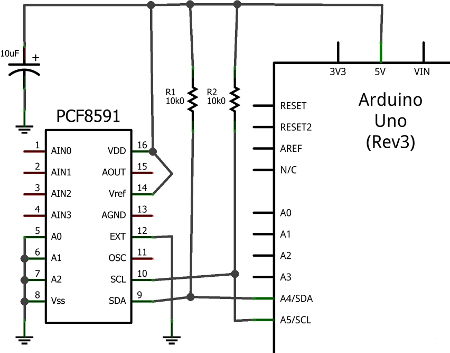 The post Tutorial – Arduino and PCF8563 real time clock IC appeared first on tronixstuff. 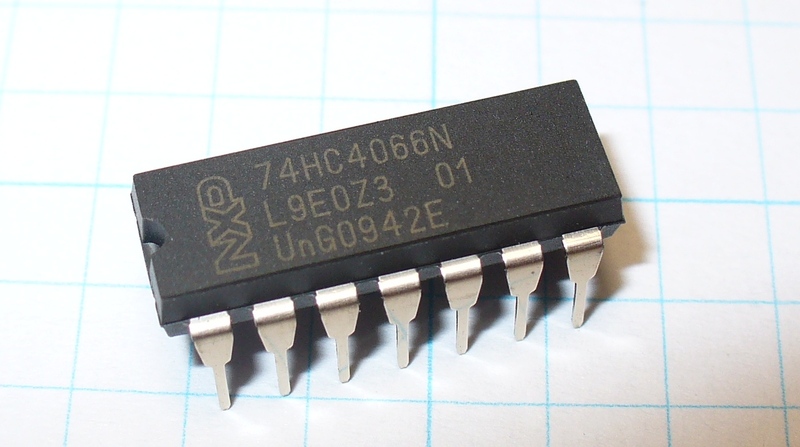 Today we are going to examine the 74HC4066 quad bilateral switch IC. My reason for writing this comes from a comment left by a reader on chapter nine of the Arduino tutorial. They suggested using a 4066 IC to control the cathodes of the LED matrix instead of resistors and NPN transistors. This was a good suggestion, however the 4066 can only switch a current of 10mA per pin. 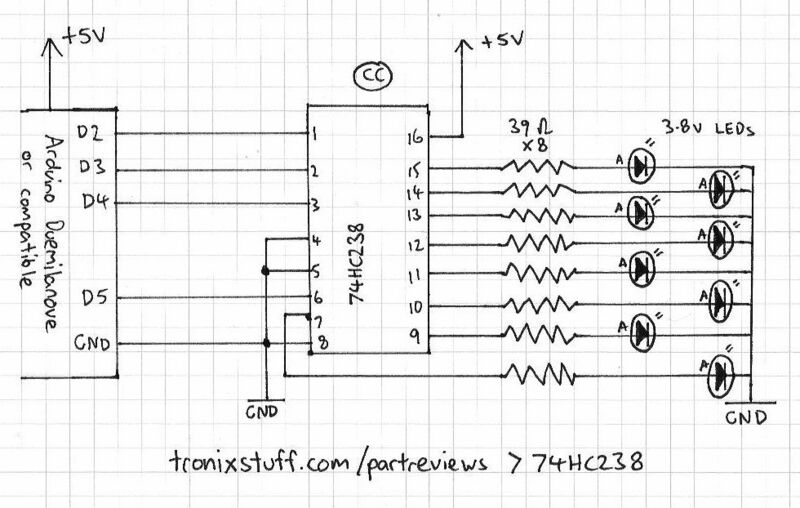 Luckily the 74HC4066 can handle up to 25mA per switch – so we’ll look into this instead. This is the 14-pin DIP package. It is also available in surface mount, and other newer package styles. 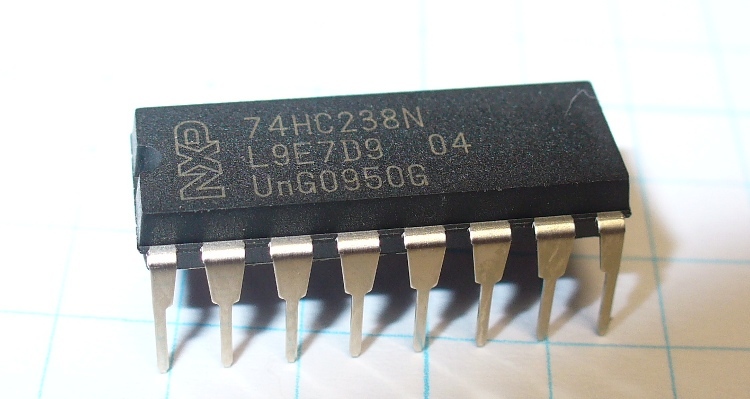 Although we are looking at an example from NXP, according to my main component supplier (Farnell/Newark) this IC is also manufactured by Texas Instruments, ON Semi, ST Microelectronics and Fairchild. Imagine a simple normally-open push button. You press the button, and current can flow through the switch. 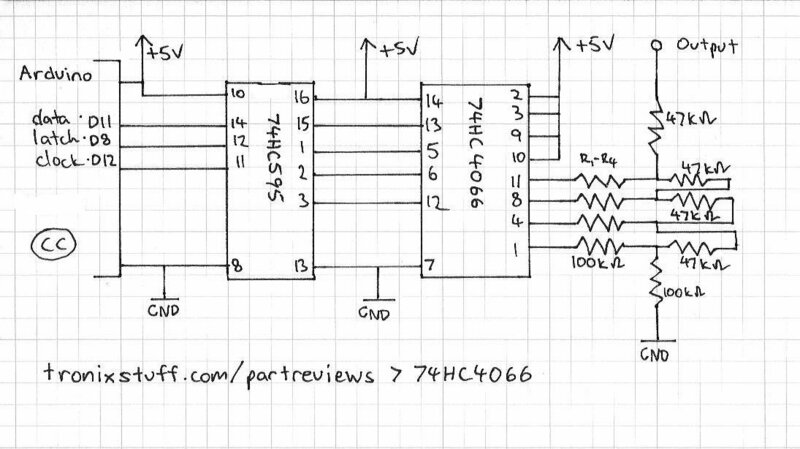 Using the 74HC4066, when current is applied to the E pin, current can pass through from the matching Y pin to the Z pin. 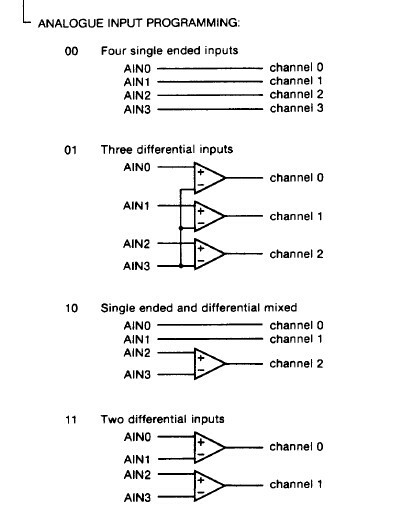 As you can see above, there are four of these switches in the IC. This is where the benefit of the IC comes to mind, normally one might use a 1k ohm resistor and an NPN switching transistor as an electronic switch, and I have done so myself. But when you need a few of them, it can be easier to start using these 74HC4066s as long as the current requirements are met. 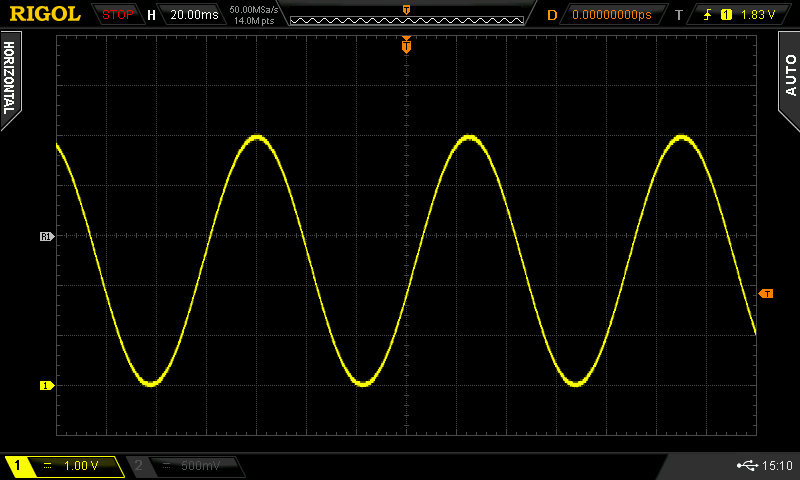 With regards to the current the IC can switch, Is, the maximum is 25mA per switch. This is more than enough to run a typical LED, TTL logic gate, etc. The other interesting parameter is the turn-on and turn off times – at 6 volts it can turn on in around 10 nanoseconds and turn off at around 13 nanoseconds (so a rough calculation – say it takes 30 nanoseconds to switch on and then switch off, that’s 33.3 million times per seconds (33.3 MHz). All these parameters and more are available from the data sheet (pdf). Someone correct me if I’m wrong! That’s enough theory – let’s put it to work now. 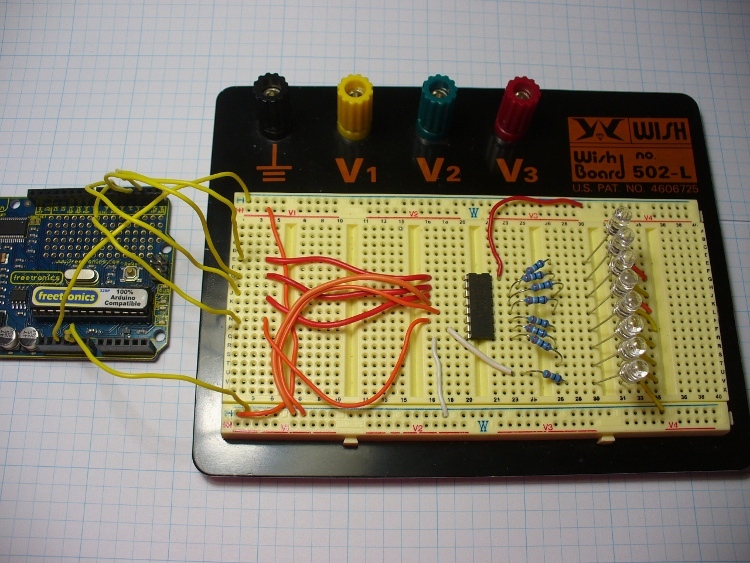 Our first demonstration is quite simple – just switch on and off some LEDs via a 74HC595 shift register and an Arduino. 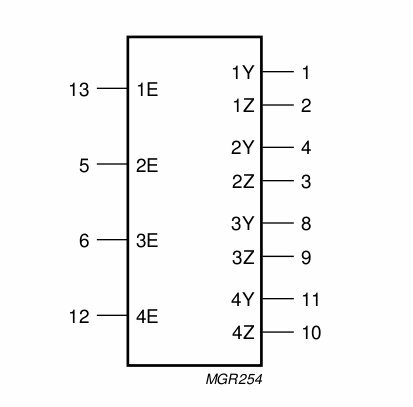 We send a number (0, 1, 2, 4, 8 ) to the shift register, which stays off, then sets pins Q0, Q1, Q2, Q3 high in order, which in turn activate the switches 1~4 on the 74HC4066. The 74HC4066 sends a current to each LED connected to the switch outputs. and the corresponding Ardiono sketch:demo3.pdf. Well I hope you found this part review interesting, and helped you think of something new to make. In conclusion I would consider the 74HC4066 easier and quicker for end user to use in projects (less pins to solder, etc) however using it could cost more depending on the volume required. Furthermore, this would only apply if the current restrictions of the IC are met. As always, thank you for reading and I look forward to your comments and so on. Furthermore, don’t be shy in pointing out errors or places that could use improvement. Please subscribe using one of the methods at the top-right of this web page to receive updates on new posts. Or join our new Google Group. High resolution photos are available on flickr. Notes: In writing this post, I used information from NXP, plus information and circuit inspiration from various books by Forrest Mims III. You are currently browsing the archives for the NXP category.